He has served in Chechnya and Ukraine and was made a "Hero of the Russian Federation" in 2014. 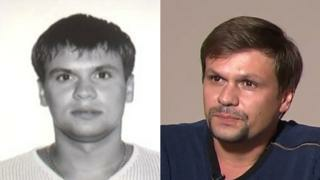 Dmitry Peskov, a spokesman for the Kremlin, insisted that the suspect is a civilian. He said: "Many people look alike." Ex-Russian spy Sergei Skripal - who sold secrets to MI6 - and his daughter Yulia were poisoned with Novichok on 4 March. The 39-year-old trained at one of Russia's elite academies and served with a special forces unit under the command of the GRU - Russia's military intelligence service. When UK police identified Boshirov and Petrov, Russian President Vladimir Putin insisted the pair were innocent civilians. A day later, on 13 September, the pair appeared on Russian TV and claimed they were simply tourists, visiting Salisbury to see its "famous cathedral and its 123m spire". Boshirov - or Colonel Chepiga - said he and Mr Petrov were in the sports nutrition business, but were travelling for pleasure. The two men told Russia's state-run broadcaster that their lives had been "turned upside down" by the allegations. "We're afraid to go out, we fear for ourselves, our lives and lives of our loved ones," Boshirov said. Foreign Secretary Jeremy Hunt has said he had a "frank exchange of views" with Russian foreign minister Sergei Lavrov about the incident. Speaking to Sky News on a visit to the United Nations General Assembly in New York, he said he had made clear to Mr Lavrov there would be a "price to pay" for the country's actions. "It was pretty tough because it is not acceptable for Russia to instruct two GRU agents to use chemical weapons on British soil," he said. "Our message to Russia is very straightforward: 'If you do this the price will be too high." Addressing world leaders at the United Nations on Wednesday, Theresa May criticised Russia for its "desperate fabrication" over the Salisbury spy poisoning. Describing itself as "the home of online investigations", Bellingcat says it uses open-source computer software and social media as part of its work. Founded by Eliot Higgins, a British blogger and journalist, the firm has also carried out probes into the shooting down of Malaysian Airlines Flight MH17 in Ukraine, the wars in Syria and Iraq, and Mexican drug lords. The firm says it then obtained extracts from the passport file of Anatoliy Vladimirovich Chepiga, which contained a photograph that strongly resembled a younger "Boshirov". A Bellingcat journalist, who writes under the pseudonym Moritz Rakuszizky, said he believed the firm was shortly going to be able to identify the second suspect in the Skripal case. "We believe based on the information we have gathered so far that he [Petrov] is a junior rank relative to Chepiga," he told BBC Two's Newsnight. "We think he is someone who is at the captain level or a senior lieutenant level."